Can the Reds halt the Rams? Rams RFC will be hoping to extend their winning run in National Two South when they travel to the Recreation Ground to face Redruth on Saturday. The Rams have won eight games on the bounce and their tremendous form means they enter the festive period nine points clear of the rest of the field. Seb Reynolds’ men can continue to stay firmly in control of the title race in Round 13 if they can come away from Cornwall with a ninth straight victory. Canterbury moved into second spot last week and they will be keen to back up their victory over promotion rivals Henley Hawks when they take on an in-form Old Albanian side on Saturday while the aforementioned Hawks are out for a response when they go to London Irish Wild Geese. The Geese currently find themselves in the bottom three and they are joined by Birmingham and Solihull & Guernsey. This week, the Bees take on Bury St Edmunds in an important game down at the wrong of the division while Guernsey take the trip to Dings Crusaders. Meanwhile in National Two South, Tonbridge Juddians go to Worthing Raiders, Taunton Titans entertain Old Redcliffians and Barnes face Clifton. 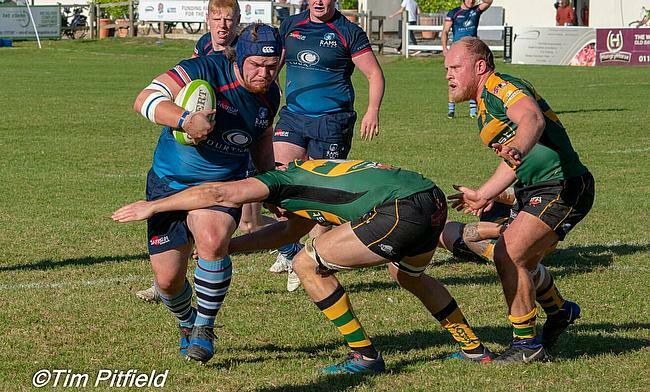 There have been games which have grabbed the headlines more than others over the past few weeks, but Rams RFC are very much the outstanding side in National Two South. Seb Reynolds’ men have continued to stay control of the promotion race and an eighth win in a row against Worthing Raiders in Round 12 tightened their grip on top spot. Rams strong first half wins game against Worthing. It was an emphatic 41-12 victory at Old Bath Road and the Berkshire club will now be aiming for nine wins on the trot when they visit Redruth this weekend. At one stage this season, the Reds were in the hunt for a top two spot alongside the Rams, but a dip in form has seen Pale Nonu’s side slip out of contention for now. However, the men from the Rec did pick up their first win in over a month last week as they battled to a tense victory over Barnes. Redruth now face the table toppers in Round 13 and they have lost on just one occasion at home this term so can they make life difficult for the Rams on their own patch this weekend? Canterbury moved into the top two of National Two South last weekend after an excellent away victory over promotion rivals Henley Hawks. The City Men secured their fifth win on the bounce and now Andy Pratt’s side find themselves in second place as we enter December. The Kent-outfit have been superb in recent weeks, but so have their visitors Old Albanian. OAs will arrive at the Marine Travel Ground on Saturday having won their last four matches and the side relegated from National One back in April look to be finding their feet at this level. Gavin Hogg’s men are now just seven points behind Canterbury so a fifth victory on the spin would certainly move the Hertfordshire outfit into the promotion picture. It was a feeling which they haven’t tasted for a while. Henley Hawks fell to their first defeat since September 22nd as they lost 32-29 to fellow promotion candidates Canterbury at Dry Leas. The defeat in Round 12 also saw Nigel Dudding’s side fall out of the top two places in National Two South so they will be aiming for an immediate response when they travel to London Irish Wild Geese. The Hawks will be favourites to return to winning ways with Wild Geese sitting in the bottom three, but Lee Starling’s men will certainly cause their visitors problems. The home side picked up a crucial win over relegation rivals Guernsey last time out and it means the Hazelwood outfit are only two points from safety. The Wild Geese have also won three of their last five games so they will be keen to continue their upturn in form as they aim to move out of trouble. Tonbridge Juddians moved up to fourth place in the National Two South standings last week following a superb win over Taunton Titans. Peter Dankert’s side have now won their last four matches and their excellent recent form leaves them just five points behind second placed Canterbury as we begin the festive period. They will have their sights set on a fifth straight victory in Round 13 against a Worthing Raiders side which is struggling to recapture their early season form. Jody Levett’s men had won four of their first eight games, but since the middle of October, the Raiders have only managed to secure one victory. The Sussex outfit do have a long list of injuries, but Worthing have said they won’t use that as an excuse as they look to get their campaign back on track at Roundstone Lane this Saturday. What is it about this time of year and Taunton Titans? The Somerset club seem to be going down the same path once again in 2018 and it is an avenue they were wanting to avoid. For the last few seasons, Tony Yapp’s side have begun the campaign in good form, but as soon as the winter months set in, Taunton’s form starts to dip. It is no different this term as the Titans have lost their last three games and have fallen away from the promotion race. The men from the Commsplus Stadium will now be aiming to reignite their season when they host an Old Redcliffians side on Saturday, who are embroiled in a relegation battle. A derby day loss to Dings Crusaders in Round 12 means the Old Reds are just two points clear of the bottom three, but can they use Taunton’s indifferent form to claim only their third victory of the season? Barnes’ five game winning run may have come to an end last week, but they would have taken a lot of positives in defeat against Redruth. The London-based side were narrowly beaten 14-12 and may have been frustrated not to claim a victory against a Reds side who had a player sent-off, but nevertheless, Barnes will head into this fixture with Clifton in high spirits. Barnes currently sit eighth in the league standings and they will be more than satisfied with that after securing promotion to this level back in April. As for their opposition in Round 13, Clifton come into clash with some confidence behind them having picked up a hard-fought win against Bury St Edmunds last Saturday. Victory at Station Road halted a run of four straight defeats and it leaves Matt Salter’s side seven points clear of trouble so back to back wins for the Lavender and Blacks would be an excellent way to begin December. It was derby delight for Dings Crusaders in Round 12 as they comprehensively beat near neighbours Old Redcliffians to return to winning ways in National Two South. Luke Arscott’s side had lost three games on the bounce prior to their win at Scotland Lane, but Dings tasted victory in the sweetest way possible last week. The Crusaders enter December 13-points clear of the relegation places, following their promotion from South West Premier, and they can continue their very solid return to this level when they host Guernsey on Saturday. The Raiders were also promoted into this league back in May, but their fortunes have been contrasting. Jordan Reynolds’ side currently sit in the bottom three and a defeat to rivals London Irish Wild Geese was not the result they were after at Footes Lane in Round 12. The Channel Island outfit are now one point from safety so a victory on Saturday afternoon could see them move out of the drop zone. It was not the start new head coach Nick Wakley would have wanted. A narrow home defeat against Clifton to begin his reign means the Wolfpack are without a victory in five matches and they have only won one of their last eight games in total. The Suffolk side are now seven points clear of the relegation places, but they have the opportunity to begin the festive period with a much-needed boost when they take on Birmingham and Solihull. The Bees sit in the bottom three as things stand and back to back defeats against Henley Hawks and Old Albanian have left them at the foot of the division. However, Pete Glackin’s men have picked up two wins from their last five games against sides who are towards the wrong end of the table and the Midlands club will be hoping for a similar result at Portway this weekend as they currently sit six points from safety.